The Corporation continues to intersect high-grade gold structures and expand the gold potential of its McKenzie Break deposit. Visible gold found in 12 of the first 41 holes drilled to date, including hole MK-18-196 from the first set of results, which intersected 265.00 g/t Au over 0.6 metres. 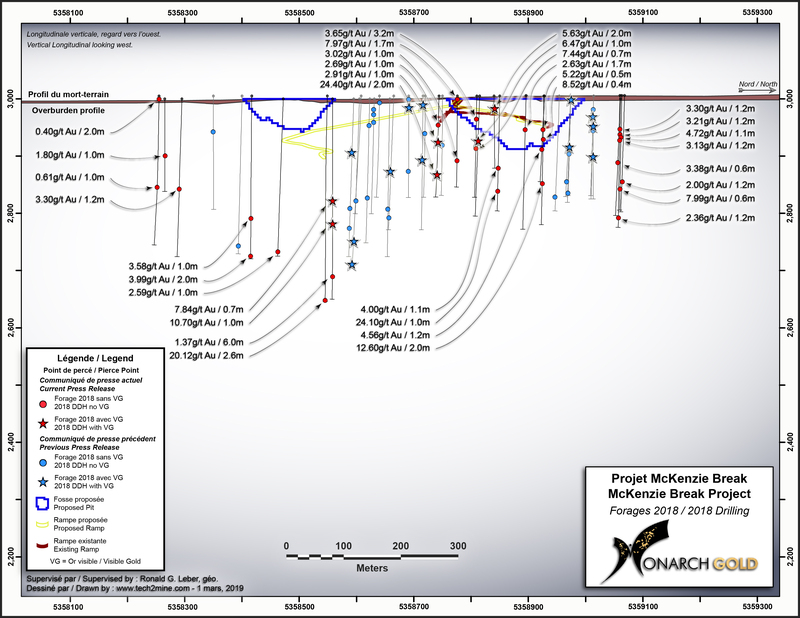 MONTREAL, March 13, 2019 /CNW/ - MONARCH GOLD CORPORATION ("Monarch" or the "Corporation") (TSX: MQR) (OTCMKTS: MRQRF) (FRANKFURT: MR7) is pleased to report the second set of assay results from the 2018 diamond drilling program at its wholly owned McKenzie Break gold project 25 kilometres north of Val-d'Or, near its Camflo and Beacon mills. The program started in September 2018 and ended in December 2018, with a total of 13,945 metres drilled in 61 holes. The purpose of the program was to explore below the known lenses and on the periphery of the multi-vein Green and Orange zones. Assays have been received from an additional 20 holes totalling 4,469 metres of core (see table below and press release dated February 28, 2019 for a compilation of the 2018 assay results). "Like the first set of holes, this second set generated solid results that extended the deposit eastward and at depth, especially hole MK-18-205, which intersected 2.6 metres of 20.12 g/t Au at 360 metres (see plan view), our deepest intersection yet," said Jean-Marc Lacoste, President and Chief Executive Officer of Monarch. "Since the program started, we have been convinced of the potential to increase the resource between the Orange and Green zones, as well as to the east and at depth, and the results of the first 41 holes only strengthened our conviction (see longitudinals from the first set of results and the results to date). There is little doubt that McKenzie Break merits further exploration." Hole MK-18-216 returned 24.40 g/t Au over 2.0 metres, including 93.80 g/t Au over 0.5 metres, at 140 metres below surface. There are two historical holes near this hole, within the same structure, one 50 metres northeast that returned 19.89 g/t Au over 0.9 metres and the other 60 metres northwest that returned 3.09 g/t Au over 1.5 metres. Together, the three intersections confirm the continuity of this lens below the main lens of the Orange zone. 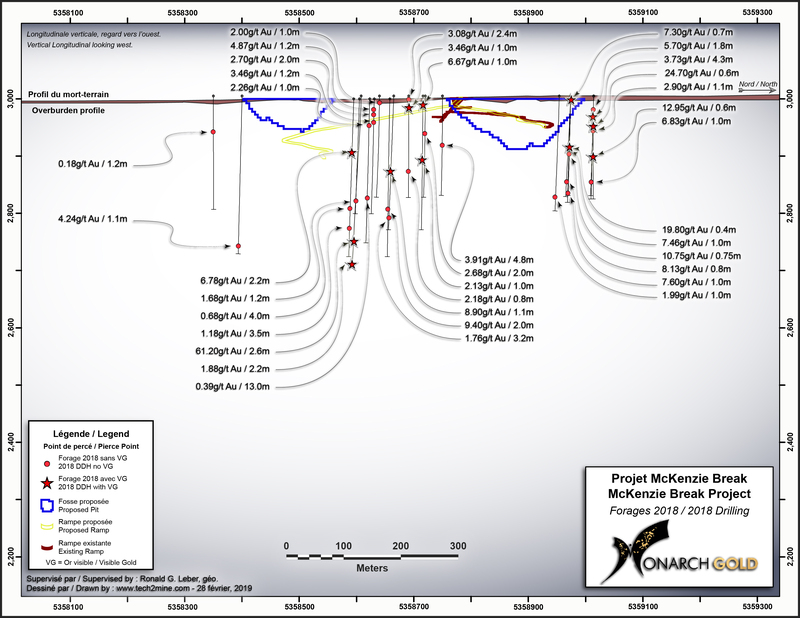 Hole MK-18-205 returned 20.12 g/t Au over 2.6 metres, including 32.20 g/t Au over 0.5 metres, at 360 metres below surface. Two holes drilled in 2008 intersected impressive values near hole MK-18-205, the first 55 metres to the west and the second 160 metres to the west, along the same structure. The first hole returned 18.10 g/t Au over 1.5 metres and the second returned 3.28 g/t Au over 2.5 metres respectively. Hole MK-18-205 has confirmed the continuity of this structure, which remains open to the east. Holes MK-18-213 and MK-18-211 were both drilled to the east of the Green zone, with hole MK-18-213 drilled 100 metres north of hole MK-18-211. Hole MK-18-213 returned 12.60 g/t Au over 2.0 metres, including 25.20 g/t Au over 1.0 metre, and hole MK-18-211 yielded 24.10 g/t Au over 1.0 metre. Both intersections were from the same horizon and structure, about 165 metres below surface, indicating that the mineralized zone remains open to the east. *The width shown is the core length. True width is estimated to be 90-100% of the core length. McKenzie Break is a high-grade, multiple-narrow-vein gold deposit hosted in the dioritic Pascalis batholith and underlain by porphyritic diorite and mafic and felsic volcanic rocks. On June 14, 2018, the Corporation reported an NI 43-101 pit-constrained resource of 48,133 ounces in the Indicated category and 14,897 ounces in the Inferred category on the property, as well as an underground resource of 53,448 ounces in the Indicated category and 49,130 ounces in the Inferred category, for a total of 165,608 ounces of gold (Source: NI 43-101 Technical Report on the McKenzie Break Project, April 17, 2018, Alain-Jean Beauregard, P.Geo., and Daniel Gaudreault, Eng., of Geologica Groupe-Conseil Inc., and Christian D'Amours, P.Geo., of GeoPointCom Inc.). Sampling normally consists of sawing the core into equal halves along its main axis and shipping one of the halves to the ALS Minerals laboratory in Val-d'Or, Quebec for assaying. The samples are crushed, pulverized and assayed by fire assay, with atomic absorption finish. Results exceeding 3.0 g/t Au are re-assayed using the gravity method, and samples containing visible gold grains are assayed using the metallic sieve method. Monarch uses a comprehensive QA/QC protocol, including the insertion of standards, blanks and duplicates. The technical and scientific content of this press release has been reviewed and approved by Ronald G. Leber, P.Geo., the Corporation's qualified person under National Instrument 43-101. Monarch Gold Corporation (TSX: MQR) is an emerging gold mining company focused on pursuing growth through its large portfolio of high-quality projects in the Abitibi mining camp in Quebec, Canada. 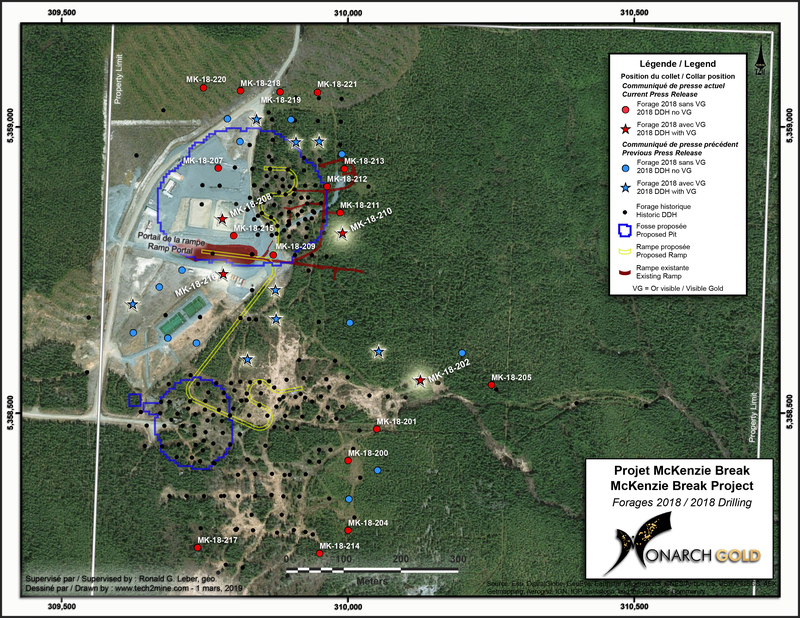 The Corporation currently owns close to 300 km² of gold properties (see map), including the Wasamac deposit (measured and indicated resource of 2.6 million ounces of gold), the Beaufor Mine, the Croinor Gold (see video), McKenzie Break and Swanson advanced projects and the Camflo and Beacon mills, as well as other promising exploration projects. It also offers custom milling services out of its 1,600 tonne-per-day Camflo mill. The forward-looking statements in this press release involve known and unknown risks, uncertainties and other factors that may cause Monarch's actual results, performance and achievements to be materially different from the results, performance or achievements expressed or implied therein. Neither TSX nor its Regulation Services Provider (as that term is defined in the policies of the TSX accepts responsibility for the adequacy or accuracy of this press release.